Samsung Galaxy Tab S4 has now surfaced online through a new render that shows its White colour version with an optional keyboard cover. The all-new S Pen for the latest Galaxy Tab model has also been leaked in a separate render comparing its aesthetics with the S Pen of last year's Galaxy Tab S3. The new renders emerge days after the design of the Galaxy Tab S4 got leaked online. 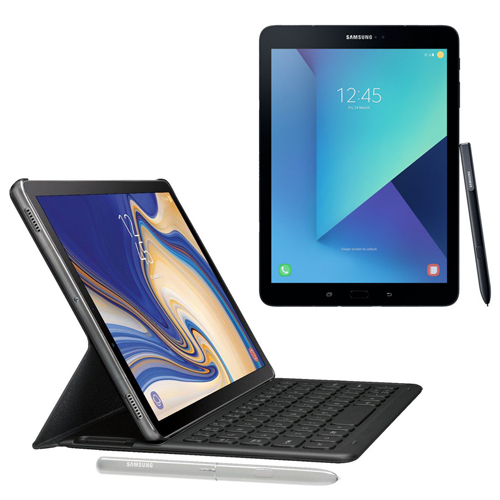 The upcoming Galaxy Tab S4 was spotted on the US FCC website last month and is expected to debut alongside the Galaxy Note 9 and a new Samsung smartwatch, which could be called the Galaxy Watch, at the Galaxy Unpacked event on August 9. Reliable tipster Evan Blass, who regularly leaks unannounced developments through his @evleaks Twitter account, has posted the render showing the Galaxy Tab S4 in White colour. The render also highlights the optional keyboard cover that looks similar to the keyboard cover of the Galaxy Tab S3 that was launched in February last year. Notably, despite being the White colour model, the tablet has the front panel in Black - identical to the Black version of the Galaxy Tab S4.